Convention centers are currently evolving, with attention shifting towards flexible meeting spaces, thoughtful design, and technological innovation. With the convention industry’s expansion, one thing remains steadfast: commitment to the guest experience. Bustling crowds, numerous entrances, and wide-ranging meeting spaces can be overwhelming and even somewhat stressful for attendees, especially first-time visitors. ITS display solutions not only allow you to increase guest satisfaction, but also boost operating efficiency and drive revenue at your location. Make navigation intuitive and convenient for visitors with building directories and event displays. 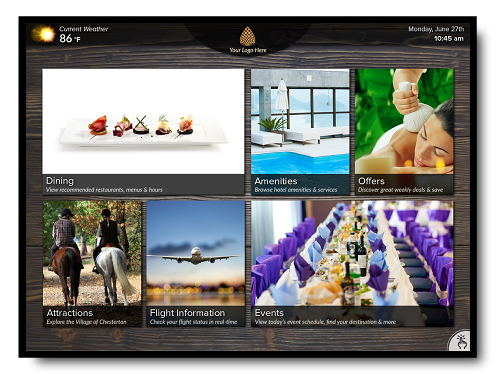 Highlight on-site food and beverage options with the virtual concierge solution, increasing traffic and generating additional revenue. Give departing attendees confidence in their travel plans with flight information, and keep delayed travelers on your property longer. ITS solutions improve efficiency and generate additional revenue, all while enhancing the guest experience. 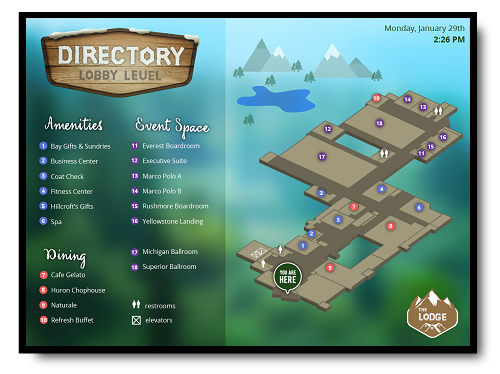 Building directories allow attendees to easily navigate throughout your venue and minimize staff inquiries at the same time. Make changes at a moment’s notice, without any additional costs or waiting. Highlight your important profit centers and drive additional traffic to these locations. Time is money, let your guests linger longer. The delayed traveler is an opportunity for your convention center to increase revenue; provide Flight Information to your attendees before they’re airport-bound. 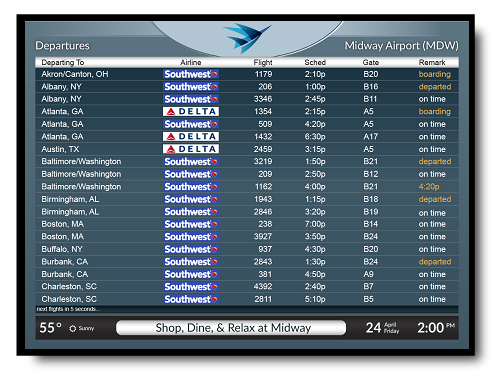 Using flight displays at your convention venue can increase sales of food, beverages, and other products & services. 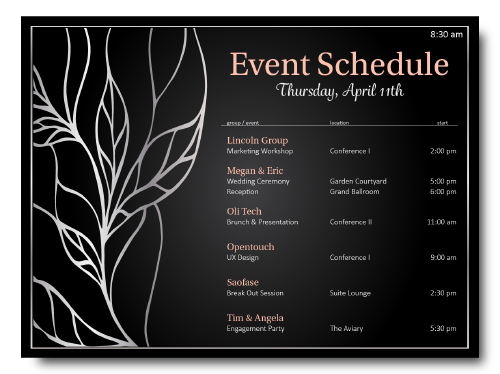 Make it quick and convenient for attendees to find their events. 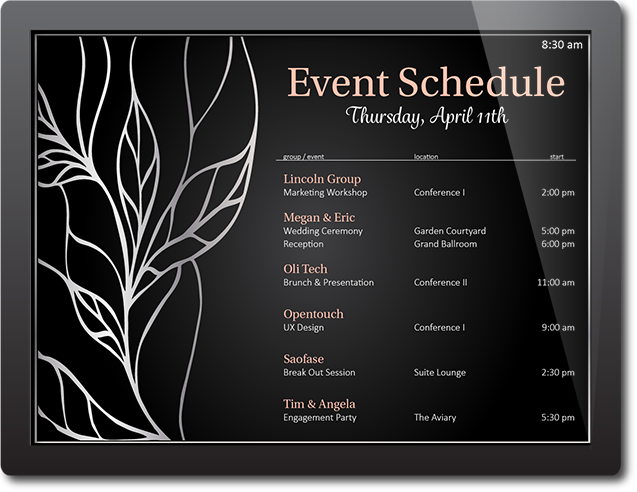 Meeting & Event Displays greatly improve efficiency by eliminating the confusion of meeting room scheduling, allowing your staff to concentrate on other guest needs. Incorporate a map of your venue for added guest convenience. Virtual concierge is the all-in-one resource for attendees. Effortlessly guide guests throughout your venue with maps and event schedules. Highlight dining, retail, and service options. Provide weather forecasts and flight information for travelers. Even recommend lodging, local attractions, and transportation options all in this innovative, centralized solution.